We often hear the term ‘Business that isn’t growing is dying’. But is it really true, or is it just a way to create an unnecessary hype around the culture of expansion and commercialization? “In today’s era of volatility, there is no other way but to re-invent. The only sustainable advantage you can have over others is agility, that’s it. Because nothing else is sustainable, everything else you create, somebody else will replicate.” So it is clear that no company can just create a product and service, and expect lack of competition. The only way to survive in a competitive environment is to constantly grow and adapt to changes, but what does growth really mean? Is it only revenue growth and expansion, or can is it a more holistic form of growth? The most common concept when anyone thinks of growth regarding business is revenue growth. Revenue growth for business is extremely important. It’s a competitive age. Businesses not only have to compete with each other to stay ahead of the curve, but they also have to compete to hire the best and most productive and talented employees. To hire and even retain such talent, their salaries should be lucrative with constant raises and benefits. With growing inflation, revenue growth is an absolute necessity. Furthermore, the lack of revenue growth can lead to declining profits, equity, employees, goodwill or a combination of all. While revenue growth is extremely important it’s not the only factor of growth in a business. It is equally important that each individual within the company grows in terms of skills, expertise, and productivity levels. This highlights the growth culture within a company, and growth culture is crucial. Consider this: employees join a company for salary, and benefits, but also to learn, grow and improve. If a company does not challenge its employees to strive, learn and constantly perform better, then they lose interest, and the work atmosphere becomes stagnant. The best and brightest minds don’t even want to work at such a company, and if this situation occurs, you will see all your talent flocking to change jobs. That is why a growth culture with constant challenges and aspirational objectives is a must in every organization. Every business that needs growing revenue, can only achieve it by growing customers. Businesses need to grow their marketing strategies, sales efforts, and overall performance to attract new clients while retaining old clients. But that isn’t possible if your customer outgrows your company’s ability to meet its demand. Often market demands for certain products increase, and if a company cannot grow to scale their supply, they lose their clients to a competitor. This is especially true for B-to-B models. We cannot consider any advancement in today’s age without talking about technology. Going digital and constantly evolving technologically is essential for every company. More than a billion people are connected on social media platforms, one-third of the population uses smartphones, and Millennials and Gen Y are all about technology. If a business doesn’t constantly keep up with the latest innovations, then it stands to lose an immense number of potential customers. Technology provides the benefits of higher engagement, increased data security, better time management, and detailed analytics, just to name a few. The importance of digitization is so widely recognized that most companies are expected to have a Chief Digital Officer soon. And the only way for a business to survive in this environment is to follow these trends or lead in creating new ones through the adaptation of the best and latest technology. Now that we have looked at the different aspects and dimensions in which an organization has to grow, we can see that they are all interlinked, and crucial to the survival of any business. But how can such growth be achieved? The simple(but not easy) way is execution. Any company that isn’t focused on the discipline of execution cannot grow. But how can a business instill a culture of execution? The answer lies in OKRs (Objectives and Key Results). OKRS are a tool or a framework used to define the main goals or focus of a company and measure the performance based on the execution of these defined objectives. But how should these objectives be defined? The same goals are often not necessary for every individual as they are for the company. One of the ways to implement OKRs is to do it in various levels. Summarizes the vision of the company. We don’t define the Key results for company objectives. These are objectives set for the CEO They can be objectives like revenue goals, minimum growth targets, expansions, acquisitions, increased goodwill etc. They must be in alignment with one of the company objectives. Managers own the objective and key results are owned by people under him or in different teams. Growth initiatives which need cross-functional collaboration can also be created as OKR’s. Used to align the aim of every team to the aim of the company. Very precise in nature; Easy to understand. Very short term, perhaps monthly. No company is formed with a static vision or purpose. Every company has a vision of expanding and growing. Hence growth is not only aspirational but, as the article highlights, essential for every company. As business leader & author, Jack Welch states in his book Winning, ‘Change before you have to’, so that you can remain ahead of the curve and grow. But the only way to consistently achieve growth is to maintain the discipline of execution. With varying departments, competing employees, bureaucratic processes, execution becomes increasingly hard. That is why a strict framework is necessary to maintain an upward trajectory. There is no better or more customizable tool for this than OKRs. If your business isn’t growing in this fast paced competitive age, it surely is dying. OKRs can be the weapon to stop this stagnancy and ensure constant growth. 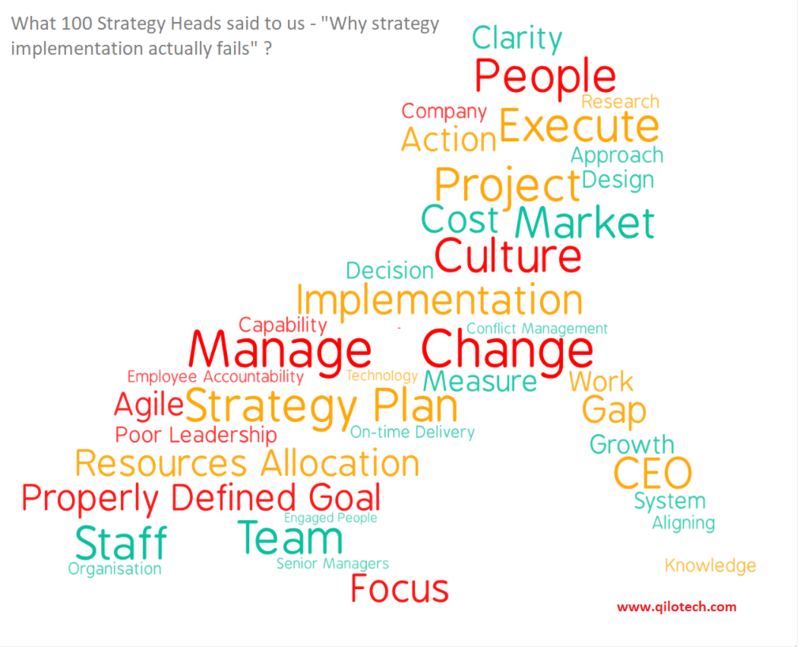 We interviewed around 91 Strategy, PMO and Business Performance Heads to understand what actually it takes to actually implement the strategy? While companies will do internal brainstorming or will take the help of consultants to define the strategic direction of the company. But when it comes to execution and actual implementation of the plan that will help them to achieve that strategy, things move terribly slow. And we didn’t conduct a typical survey but talked to them 1:On:1 to understand the challenges they face. And did analysis after converting our conversations into text and doing text and sentiment analysis on top of that text. Why change management is required? Because you are dealing with humans. Humans which are at top most senior positions with big egos and “know it all” attitudes. The main aim of a strategic plan is to change the way people are doing things and building new habits; with the hopes that it will enable the change in process and see better results from operating in a new way. But things dont move and people struggle to change their habits. Solution: When you introduce your strategic plan (or operational plan, or merger & acquisition plan, or cost reduction plan – you get the idea – any plan that introduces new initiatives), it’s important to remember that most people aren’t involved in the planning process. The way the plan is initially introduced needs to be carefully crafted so as to address concerns and the what’s-in-it-for-me right away to start out on the positive path to change adoption. (c) There is no standard, easy & repeatable way to creating the plans linked with strategic directions/goals. Solution: Implement frameworks like OKR to create a recipe for defining the implementation plan. OKR as framework helps your teams to think, plan, execute the plans every quarter to achieve your strategic goals. 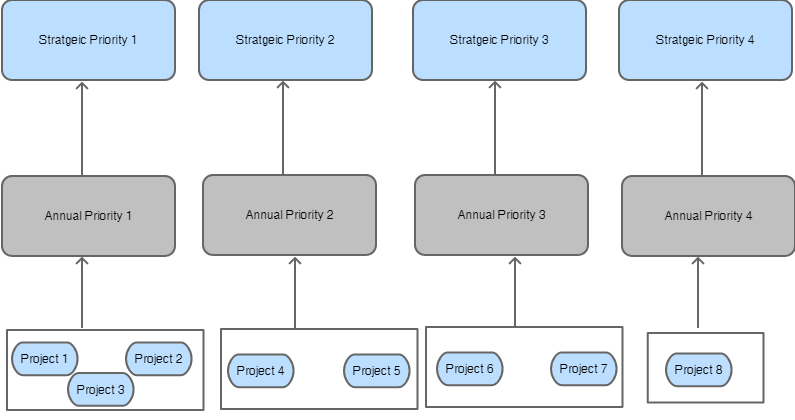 Doing the resource allocation is one of the toughest jobs for business heads who are ultimately responsible for allocating people to programs and projects created to achieve the strategic objectives. There is no visibility at the strategy head and business unit head level where their people are actually busy and who are the people who can be allocated. Solution: Take the help of tools and technology to determine the people who can be allocated to the initiatives, programs, and projects. Company culture cannot be quantified, but you can feel it. Most of the organizations over the years have become bureaucratic, hierarchical and lacks the speed, agility & candor to achieve the required execution. Solution: Involve an awesome Organizational Behaviour & Development Professional in your strategic planning and implementation phases. Now, this is where almost all companies struggle. Strategy heads own agenda of strategy, don’t own the people who do the required execution on initiatives, programs, and projects that help us to achieve the strategic goals. Teams(people from different functions) who are execution the plans don’t come together enough on their own and do the required review and course correction of the action plan, which results in the delay of execution. Solution: Take the help of a habit-forming technology tool that helps you apply the agile process of execution in your teams. The future of strategy execution is about how you can implement a simple, repeatable process that can be applied at scale to get execution done on your strategic goals. Is OKR a New Management FAD ? In the last 30 years, many concepts were introduced in the companies claiming to have been that final solution that it will accelerate business growth. As part of these, concepts like Enterprise Performance Management, Business Process Management, Balanced Scorecard, and Knowledge Management where introduced in the market and promoted by consulting companies & leading business schools of the world. But they had a low impact on revenue growth, enhancing customer satisfaction and launching new products faster. And have only increased the revenue of consultants & consulting companies. Nowadays OKR (a goal-setting framework for CEO and companies to get execution done) seems to be the hot topic. And every CEO is talking about implementing the same in their company. 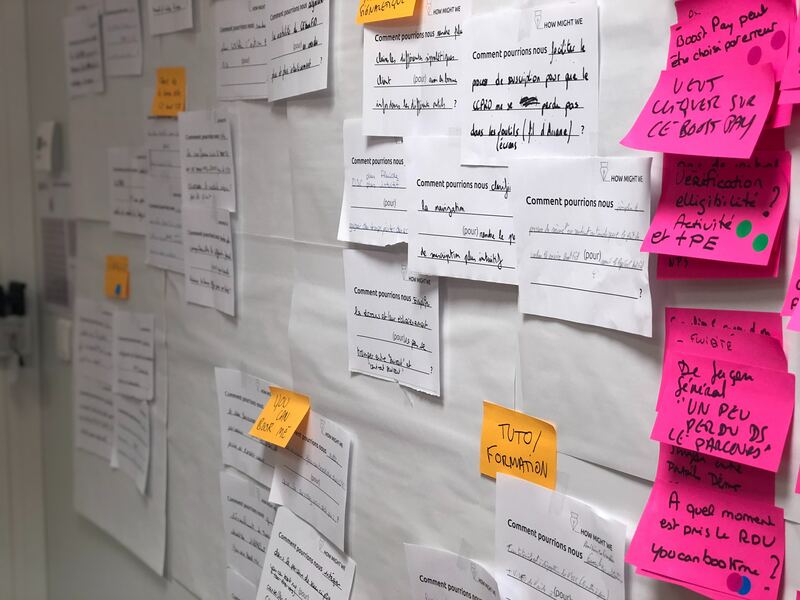 OKR is a part of the debate that companies need to adopt agile management practices; so that companies can respond to changing market dynamics faster. New entrants, especially from developing markets and technology sector companies are moving into traditional companies and leveraging the power of Software+Hardware to disrupt the existing business models. And this is happening right now. A third of Fortune 500-companies in 1970 were gone by 1983. And many of those that were in the top-10 in 2015, didn’t even exist ten years before that. The attrition in leadership positions in big companies has more than doubled in the past 10 years. Google, Microsoft, Amazon, NetFlix, Uber and AriBnB are replacing the Coca-Cola, Big Retail, Media House and Established Hospitality industry Companies as most valuable companies. Though these 20 year old new-age organizations are leveraging technology to deliver the product/services, they are also challenging the traditional management practices. They are adopting new agile principles and practices that enable them to remain closer to their customers, build a more transparent company and build a culture of thinking, planning and execution in their teams which enable them to move faster than existing traditional mindset companies. But does this mean that every organization must adopt agile management practices and implement goal-setting frameworks like OKR. To answer this, we must under from where the “agile” as a concept came from. The agile as a concept was first introduced around 2001 to better deliver the software. Before the agile practice came to picture, software’s were delivered to customers using the waterfall model of development. With the waterfall model, customers used to get the working software after 9 to 12 months. And by the time, they have received the software, customer requirement and business process to which the software was catering has changed. At the end, customer end up paying millions of dollars for something which was not near to what is required. Then came the Agile way of delivering the software, in which software was delivered every 2 weeks. The customer gets the working software every 2 weeks. And the software developers adjusted to the evolving needs of customers. This resulted in customer end up spending less money and is more satisfied with something tangible for what he is paying for. I have personally developed the software under the waterfall model and agile models. Frankly, adopting agile mindset was very difficult and was a change. People resisted it because it forced them to be on their toes, be more focused & accountable and forced then to be more collaborative across various teams. And you are clearly able to identify who is not performing within 2 weeks. Now let’s look at the organizational age-old practice like “annual practices of budgeting & planning” and how it gets delivered by people in the company. Leadership team meets before the start of the financial year, sales targets are negotiated, CEO and management pushed for higher numbers and sales heads push back the numbers given and tried to freeze targets which can be achieved. New initiatives that needs to be completed are decided and everyone goes back happily to the workplace next day. Think of your annual budget and planning process as software. Currently most companies are trying to deliver the budget & planning by following the waterfall model. A better way is to follow the agile way of quarterly process which is aligned with the company annual budgets & initiatives to be completed. Objectives (a.k.a goal) & Key Results(a.k.a milestones or action plan) to achieve the annual plan are created executed, reviewed & updated every quarter. Frankly, achieving business results (sales plan, marketing plan, strategic initiatives) are different from programming a software. Unlike software programming, you might or might not achieve result (0 or 1) in a day, week or 2 week. But creating the OKR plan at the start of every quarter and reviewing it every month, will help you understand that will the outcome be achieved or not. Or enable you to understand that if you are all this time, trying to achieve the wrong outcome. The current execution design followed in companies leads people to focus on outcome rather then focusing on input that will lead to that outcome. If I connect the dots, I have no doubt that adopting the agile management practices and frameworks like OKR(Objectives & Key Results) are much better approach to deliver the required business outcomes. What you think? The Brightline™ Initiative is a coalition led by the Project Management Institute together with leading global organizations dedicated to helping executives bridge the expensive and unproductive gap between strategy design and delivery. Like the Agile principle which helps in delivering the Software, Brightline has listed the 10 principles that can help in achieving the Strategy. Those who are not from a software background might not know that before the Agile practices of developing the software came to picture, the software was developed using the model called “Waterfall model”, where software was delivered taking 9 to 12 months. And by the time the software was shown and delivered to the customer, customer requirements and expectations from the software have been changed. Then came the Agile principles, where software was delivered to customers every 2 weeks. This has lead to a better understanding of what the customer wants out of software and reduced the overall cost in developing the same. Now think of Strategy deliver in your company. Being from the Software background, I can clearly see the Strategy a.k.a the business plans a.k.a growth goals are still getting delivered in the waterfall model. Many Strategy Heads, CEO offices and PMO offices are living in “Waterfall model” age, where the focus is on Governance, following the same old processes that cause the delay in the actual execution. But I feel with Brightline initiative, the thing might change, and it will bring the Agile like principles in delivering the Strategy. Principle #1 – Acknowledge that strategy delivery is just as important as strategy design: Strategy is not just a fancy word for the business plan. Bringing your strategy a.k.a business plan needs more than just annual offsite. The implementation plan to get execution done needs to be created in a way that it actually leads to the getting execution done. Principle #2 – Accept that you’re accountable for delivering the strategy you designed: Once you have defined the strategy, your focus should shift to overseeing the progress of implementation so that the strategy delivers results and achieves its goals. You need to know what is your company execution velocity and how the program managers are performing on the identified growth goals and the people who are moving slow on the execution. Principle #3 – Dedicate and mobilize the right resources: Strategy deliver is a team game. To achieve your strategy to get executed, you need to enable your program managers to easily identify & build the team that will help you achieve the growth goals/objectives which will ultimately help in achieving your strategy. Principle #4 – Leverage insight on customers and competitors: No plan survives contact with the enemy. To course correct your growth goals and objectives, keep talking and listening to your customers and leverage insights from your competitors. Otherwise, you will end up executing a plan which might not be relevant to current market conditions. 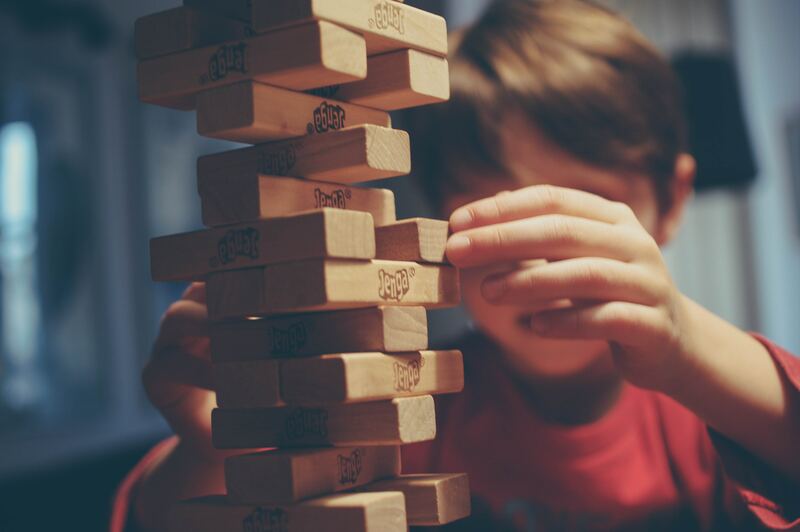 Principle #5 – Be bold, stay focused and keep it as simple as possible: Your team may end up losing focus on the growth goals and objectives which will help you achieve your strategy because of day-to-day operational urgencies. By keeping the plans simple at the same time bold will help bring back the focus on execution. Principle #6 – Promote team engagement and effective cross-business cooperation: To gain the buy-in on executing the growth goals you need to involve the people who will be actually doing the execution. As a leader, CEO and Strategy head, you need to communicate with them, engagement them in the process of creating the plan and keep explaining to them why we are doing what we are doing. Principle #7 – Demonstrate bias toward decision-making and own the decisions you make: Many plans fail and keep the pace with changing business conditions. At qilo, while implementing our solution across different companies, we have seen that it’s far difficult to update those metrics and milestones that help the team to achieve the growth goals. And this happens because the process of making these updates are complex and bureaucratic. By keeping the governance process simple, you can always empower your people to change/adjust the plans per the internal and external business conditions. Principle #8 – Check ongoing initiatives before committing to new ones: Strategy is delivered by identifying few strategic initiatives and then linking the growth goals that will help you to achieve those strategic initiatives. Many times leaders end up starting the new strategic initiatives before the previous initiatives see the light of the day. Avoid committing to new things before you finish the previous one. Principle #9 – Develop robust plans but allow for missteps — fail fast to learn fast: Even the best people and teams fail to deliver. It’s up to the CEO and CEO office, Strategy head to create the environment where failures are acceptable and seen as learnings. Principle #10 – Celebrate success and recognize those who have done good work: This is where most companies fail. CEO office, Strategy Heads and Program managers fail to recognize the people who are actually executing the growth goals and demonstrating the habits that are leading to execution. People who are involved in the execution of strategic plans are doing those in addition to their day-to-day operations, recognizing them is crucial for the success of achieving your growth goals. As a CEO/Founder, you have already taken your company from point A to point B. You have survived the initial 2 to 5 years of journey to build a company. Now you clearly understand what kind of people will be able to work with you and in your company, and most importantly you are revenue positive too. Hiring right kind of people. Constantly aligning People beyond Leadership with your Strategic and Annual Business Plan. Investing in people efficiency and effectiveness. Hiring the right people is the core of every business. It makes sense to outsource your hiring if you choose to remain small. To grow your business from point B to C, you need more people. It starts with investing in the right kind of talent acquisition team who will be in charge of hiring the right people for you. And making sure your existing people are accountable for hiring the right people. And make your talent acquisition team accountable for hiring the people with right kind of behaviors. The first step of hiring the right kind of people is to create the data-driven process of hiring. You create the Interview Score Cards which are easy to be understood by employees who are hiring on your behalf. These interview scorecards are created for each department separately. Even if you don’t want to score people, just identify the required skills and required behaviors specific to your company and mark it yes and no. Probably Strategic Business Plan and Annual Business Plan(also called Annual Operating Plan) are big jargonish words for you. Many first-time entrepreneurs & CEO’s don’t understand them, and many feel that it’s a corporate company thing. Strategic Business Plan(SBP) is about what you as the founder(s) & CEO want to achieve in next 3 to 5 years. Its about what point “C” looks like. If you don’t want to put in detailed SBP, you can simply put in place 3 to 5 statements indicating what as a company you want to achieve in the next 3 to 5 years. Draft these statements and get these statements validated by your leadership team. Annual Business Plan(Also called Annual Operating Plan) is about how as a company you have to performance in a particular financial year to meet your Strategic Business Plan. Many companies break down their revenue targets till sales executive level and think they are done with it. And many do create a plan beyond achieving sales number during their annual offsite; but post that CEO struggles to see the action plan and execution on that action plan. Here is a quick step-by-step process to set your Annual Operating Plan and to make sure execution happen on that plan. Before annual offsite, share the 3 to 5 statements that describe what needs to be achieved in that financial year. These 3 to 5 statements should be linked(aligned) with your strategic business priorities. Validate these annual priority statements with your team before going to onsite. While you are preparing for the offsite, ask the team now to come up with 1 to 5 projects & goals for the next 3 to 6 months that will help the company to achieve these annual priorities. During the offsite, the entire leadership team validates those projects. And put in place the action plan & milestones to achieve those projects & goals. Post offsite, leadership team discuss, validate and correct these projects with their respective teams. And put this plan in action for execution. Though this sounds simple, making sure that the team remain focused on drafting the projects and milestones to achieve those projects. You need to put a person in charge who will own this entire end to end process & activity. Usually, this person has a very good understanding of your business horizontally and to whom rest of the team members will listen to. Frameworks like Objective and Key Results (OKR) can help you in achieving how to creating the strategic and annual plan and how to link people and execution with this plan. 3. a) Properly defining the business KPI’s & Projects to achieve your achieve your Annual Business Plan.And then making sure execution happens on to achieve those KPIs and Projects. 3.b) Investing in tools that enhance productivity and get work done. Most employees hate taking accountability towards what needs to be achieved by them in a company. And most managers take the decision of who is making progress and who is not based on perception; not on data. When the company invest time in setting up the process to define KPI’s and projects to achieve execution properly, it enhancing decision making, transparency from top to bottom and reduces biases between teams and across the company. One that enhances execution on your Business KPI’s and Projects. Example: CRM’s, Project Management tools, Goal-setting tools, Task management tools. Second is that help the company in enhancing customer centricity. Example: Tools to measure customer satisfaction, tools to listen to customer voice/opinions and tools to provide awesome customer support. Third are tools that reduce administrative work. Example: Financial Support Systems, HRMS etc. Company is not able to define the requirement clearly and you end up buying something which doesn’t fulfill your need. An Owner and internal champions are not defined who is responsible for successful implementation. Vendor is not helping the company to identify their requirements. Company doesn’t go into the detail on evaluating the tool in detail and don ask the right question. A UAT (User Acceptance testing) is not done properly against the requirement before rolling out to the larger audience. Not leveraging vendor expertise in implementing solution successfully. Owner of implementation is more bothered about her learning from the implementation than successful implementation. 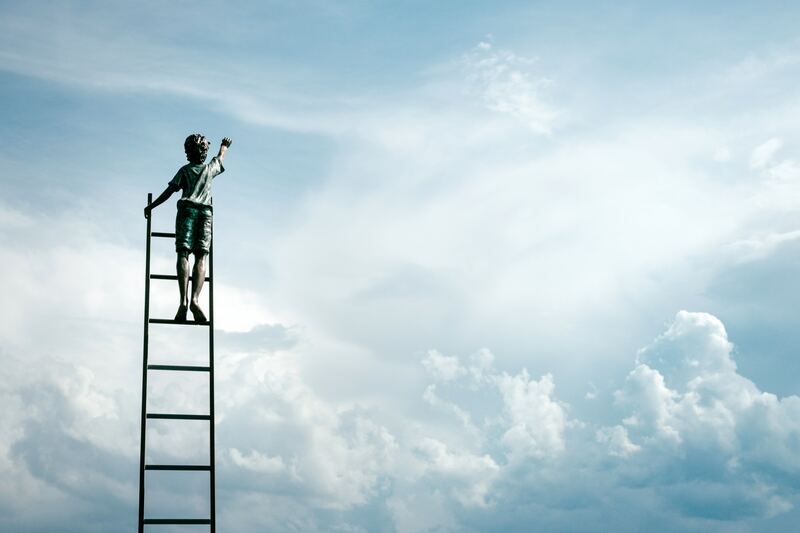 Visioning: In a 1996 HBR article, James Collins and Jerry Porras showed that companies with a strong sense of vision had outperformed the others in the stock market by a factor of 12 since 1925! Vision reflects what we care most about and is derived from our sense of purpose and values. It provides meaning, attracts commitment, and focuses human energy by drawing on our deepest yearnings in striving towards a purposeful goal. Visions provide a clear, easily understood image of a better future. Strong visions inspire employees. They embody values & behaviors, provide people in the company the purpose, and direct them to what will be different and distinctive. Team Alignment : The biggest challenge we have seen while implementing qilo is that of alignment towards the annual and long-term goals of the company. A simple test of this is to “ask your employees what are the 3 to 4 things the company wants to achieve in this financial year”. Almost 80% people in the company fail to answer this. This is CEO and leadership failure, not employee failure. With alignment workshop, focus on communicating what company wants to achieve and help people align their work with CEO’s agenda. Accountability workshop: Accountability means I will deliver the expected results from me, come what may. I will collaborate with people across teams and will not wait to be lead by someone to get work done. Building the behavior of accountability is far more difficult. And that the reason companies prefer people from top institutes and people with the excellent academic record because it shows that the likelihood of this person being accountable for execution is very high. But every company doesn’t have access to these people, and the best way to build this behavior is to constantly communicate about the importance of the same across the company. Invest in setting up the strong process and people who hire on your behalf. State your strategic business priorities in 3 to 5 statements. Draft 3 to 5 statements that will summarize your annual business plan. And link these statements with your strategic business plan statements. Invest in enhancing your leadership capabilities. And invest to set up processes and tool to enhance people productivity. Too busy for Strategic Thinking and Execution? In one of the articles published in HBR -96% of leaders believe that strategic thinking and execution will help them grow. Then what is the reason for not investing time in? Integration of Strategic Execution with Daily ops. At business we follow various review mechanisms daily, weekly, monthly, quarterly etc. but with what agenda? We normally discuss, what we all know and pass the buck to the less informed. This agenda distorts the larger picture. Strategy execution is a process that does not work like instant noodles. Ensure that during the reviews ask for progress on strategic projects and set accountability in execution for the same and remember at every instance keep on reiterating the Larger purpose and picture. Fear of conflicts – Every leader wants to be liked by all and try’s avoids conflicts with peers and subordinates. Who will bell the cat? Why should I spoil my relationship? Keeps on popping up at the subconscious levels. While framing a strategic plan or monitoring execution someone has to ask tough questions! Do not let your team be a mutual admiration society. Do not let the fear of conflicts affect the growth agenda of the organisation. I am too busy syndrome– in organisations, if you don’t act busy; you are perceived not to contributing to the business. Our calendars are packed like vacation bags (where do I find additional space). Hundred of mails to respond, of which 90% of them are in CC. Take a deep breath, and ask how many of them are relevant? The reality is we just don’t want to step out of our comfort i.e. daily execution and think and answer what we are executing, is it contributing to the larger picture? Gap between thinkers and doers. Many organisations have this funny thing, create the strategy plan without consulting with people who are executing it. And then the entire year the executors focus will be to tell how shoddy the plan is and the reason why it cannnot be achieved. While the creators keeps on harping on the incapability of teams teams to execute the desired. And the CEO sitting in the corner tearing his hair apart … funny isn’t it. Unable to answer what is in it for me – The most difficult question that the CEO has to address to the team members is what’s in it for me is it Money, Gratification, Growth? Or it’s something else like connecting them with your purpose and making them part of achieving it. Do not have the answer, let’s not discuss this. The big C – Culture eats strategy for breakfast lunch and dinner. If your orgnisation is suffring from a traders syndrom you need to act fast and like NOW! If your teams belive that creating a stategy execultion plan is a checklist then you will never be able to achive growth. It is a business imparitive that you build a culture, which creates, compete, controls and collaborates. How? in the next blog .. till them happy reading ..
Next time someone when comes to discuss the large agenda or have a plan – take out time to discuss and give importance !! Even if it is crap, appreciate the behavior of people taking initiatives.